This week I’m doing something a little different. I am out of town this weekend, so you get to do Fanciful Friday with me! Link up all your neat stuff! I am so excited to see all the links when I get back. Everyone have a fun, safe and happy Halloween! I may still check in every once in a while, but if you ask a question it probably won’t get answered until Tuesday or Wednesday. Also, don’t forget to stop by this next week and vote on the costume contest! Voting starts Sunday, Oct 31. Winner will receive something very cool! Hint: If you have a project with vinyl you’d like to do, make sure you enter the contest! Contest closes Saturday Night! Now, on with the party! How cute is this jack-o-lantern shirt by Krafty Kat! My Mr. Right is gonna love these whole wheat scones by Sheena at The Best of Mama Chef. 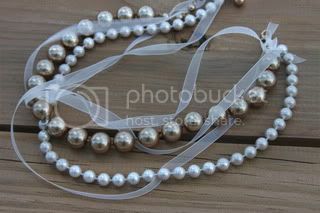 Love, LOVE, LOVE this layered pearl necklace by Kara’s Kreations! So in LOVE!! Anything with chocolate and peanut butter is definitely right up my alley! These cupcakes by Michelle at Polka Dots and Pizza are right at the top of my to-try list! Yum! Awesome work, ladies! Feel free to grab a featured button in the sidebar. That’s it. Don’t wanna follow? Don’t (But I would love it if you would… Cool stuff happens here, don’t miss out! Check out my calendar for an idea of what’s gonna be happening). Don’t wanna link back? That’s alright. I understand that’s just one more thing in your already busy life. I would appreciate any help in spreading the word about Weekend Wander, but no pressure. If you like what you see and plan on being a regular, I’d love for you to add my name to your link party list (who doesn’t have one of those, right!?!) or my button to your blog. Really don’t want to? That’s ok. I won’t tell you off or write you mean anonymous comments, promise! I just enjoy seeing everyone’s ideas. However, by linking, you are giving me permission to use your photos in a feature of your project. Of course, this feature will include a link back to the original post. Thanks! Thanks so much for mentioning me! Have a great weekend!